On October 30th, student and faculty creativity was on full display during a delightful, sometimes frightful, afternoon Halloween parade and costume contest. A steady stream of inventive costumes ranging from the delicious (a box of cheerios, a donut), to the clever (a human pac man game, the Mona Lisa), and the spooky (a creepy clown, a mesmerizing werewolf) to the silly (a piece of dirt, bananas), made the judges' deliberations difficult. 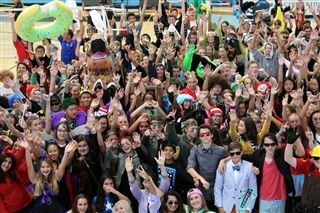 Visit the Pacific Ridge Facebook page to view all the winning costumes, and many more photos from the day!